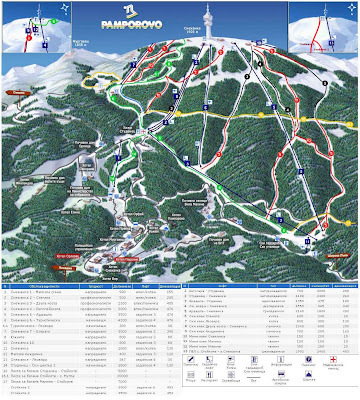 Pamporovo is a purpose-built resort and is Bulgaria's best bet for beginners and early intermediates, with mostly easy runs. Most of the hotels, at Pamporovo, face the area's only ski mountain, Snezhanka. 17.5km of pretty, sheltered, but mostly mild and short runs, cutting through pine forest, however the resort also features a giant slalom ski run.. Pamporovo can have unreliable late-season snow cover, but it has good ski schools and a fairly lively apres-ski. It is situated in the heart of the Rhodopi Mountains, 260 km from the capital Sofia, 85 km south of Plovdiv. Pamporovo is one of the southernmost skiing resort in Europe and is also the sunniest in Bulgarian. It has an exclusive climate featuring a soft winter with about 120 sunny days during the skiing period. The significant influence of Mediterranean appears here and the skiing season starts from mid - December to mid - April. The average air temperature is - 3 ° C.
The ski runs in Pamporovo come in all hardship levels. They are located between 1926 and 1450 m above the sea level on the northern, eastern and western slopes of the Snejanka peak. The major ski runs actually start from the top of the peak. .NAMES OF SKI RUNS - Snejanka, Studenetz and etc.